Looking for a LED tube fixture? LED tube fixture as replacement for your neon light fixtures at attractive prices! 2 years guarantee! Are you looking for a LED tube fixture? 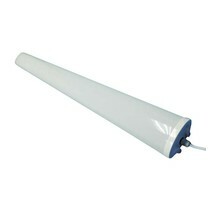 Different kinds of LED tube fixtures can be ordered at My Planet LED. We are one of the biggest online LED light shops and we deliver your order as well nationally as internationally. Our customers say we provide an excellent personalized service! 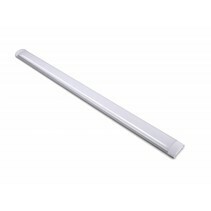 A LED tube fixture is a long fixture with integrated SMD leds. This is the perfect solution if you don't have a fixture yet or if you don't want to mess around with LED tubes in a traditional neon light fixture (this fixture would have to be converted in order to be able to use it with LED tubes). 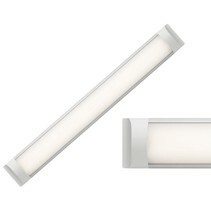 Due to its long form, it ensures a nice, spreaded light. 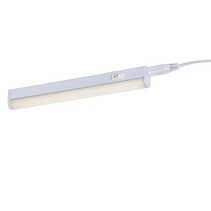 You can easily use the LED tube fixture as factory lighting or showroom lighting. You can hang it at high heights and have a lot of light! It's is available from 30cm to 1,5m, from 10W to 60W. 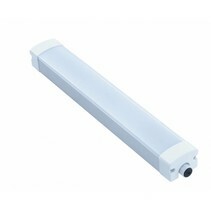 Some LED tube lights can be obtained with mat or transparent cover. If you hang the LED tube fixture low (lower than 4m), it's recommended to use mat cover because otherwise, it would be glaring. Some of these LED tube light fixtures have an waterproof degree varying from IP44 (protected against splashing of water) to IP65 (protected against water jets). Every LED tube fixture is equipped with a fixation kit. This allows you to fix it easyly and to use it as a ceiling light. However, if wanted, you can also buy a suspension kit in order to use it as a pendant light. The applications are versatile : it can be used at home (in your garage or garden house), in the office or in the factory. They are also often used in supermarkets. Besides the large choice of LED tube fixture we offer at My Planet LED, we have more to offer. We like to help you with our advice if you can't make up your mind. You can salso find a wide range in our shop Woondesign at Ieper where your can find a lot of waterproof fixtures. With us, you buy definitely your favorite LED tube fixture. Are you not sure that the IP65 LED is suitable for your factory or showroom? No problem : you can choose our 14 days return policy. Would you like to have more information about a LED tube fixture? Do you have questions? Do not hesitate to contact us at the phone number (+32) 57 466 866 or by mail (info@myplanetled.com) in order to obtain more information about a LED tube fixture.